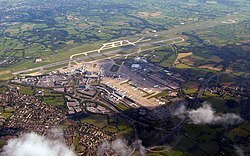 Manchester Airport (IATA: MAN, ICAO: EGCC) is an important airport in Manchester, England. It opened to passengers in June 1938. It was first called Ringway Airport. During World War II it officially became RAF Ringway, and from 1975 until 1986 the title Manchester International Airport was used. The airport is almost all within the city of Manchester boundaries—the exception being the second runway, which lies mostly in Cheshire. Manchester Airport competes with other airports nearby such as Liverpool Airport and Leeds Bradford Airport. ↑ "UK Aeronautical Information Service". AIS. Retrieved 2007-11-04. Wikimedia Commons has media related to Manchester Airport. This page was last changed on 6 September 2018, at 09:36.